Hi guys! Today I am going to talk about something a bit different. Anyone who has switched from traditional deodorant to natural deodorant knows that it can be a painful and expensive process. I have very sensitive skin, and I had a few extremely painful reactions to the more popular natural deodorant brands. When I turned to others for help, it felt like I was being told a million different things. Luckily, I was finally able to find a natural deodorant that did not make me break out. I was recently made aware of this awesome natural deodorant guide from Review.com! They went through all of the trouble to test 23 different natural deodorants and organizing it into a very helpful guide. In fact, they spent months talking with a dermatologist, a chemist, and two natural deodorant creators. Basically, they did all of the dirty work for us! One of their top finds was one of my favorites and one that I have talked about before on our Youtube Channel, Schmidt's Natural Deodorant. This natural deodorant guide has a 30-second review if you are pressed for time, but I really suggest reading all of the information it has to offer. I don't know about you but I am really happy to see a guide like this put together! 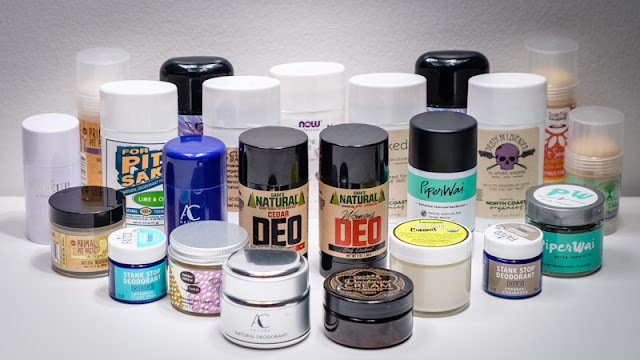 It would have been a lifesaver to have a resource like this when I was going through the process to find out which natural deodorant was best for me. I think its great that such a guide exists and has input from so many professionals! I need to make the switch over to natural deodorant but haven't had time to look into it enough - when I do this guide will sure be handy! I've been looking for good natural deo for a long time, and this looks nice. I've been interested in trying natural deodorant. The thing that keeps me hesitant though is does it only eliminate odor? Or does it also stop you from sweating? I currently use an anti-perspirant. Hi Nicole! Natural deodorant does not keep you from sweating. I used to use an anti-perspirant as well, and it took some getting used to. My suggestion would be to try a few different kind. Some will keep you drier than others, Good luck! I couldn't imagine the challenge for of having sensitive skin and needing to find natural deodorant! That's a great review to help others! It was the worst! My skin has been so much better since I switched to natural products. I honestly didn't realize there were so many options to look at when choosing a deodorant. I can tell you've done your research, this post is great for those needed to switch to a more natural option! Thanks for this guide. I didn't know there were so many options! Oh this is what i needed. I have been looking for this natural deodorant. Thank you!